Our travels on Friday, September 16 took us to our overnight destination, in Mackinaw City, MI. Saturday morning we boarded the Mackinac Island Shepler's Ferry. 6 minute ride under the bridge described below. Much of the beauty comes from the setting at the Straits of Mackinac. The Straits link Lake Michigan and Lake Huron. The 5 mile long Mackinac Bridge (Big Mac) links Michigan's Lower and Upper peninsulas. We could see the Grand Hotel, our overnight destination, as we approached the island. There is no motorized traffic on the island, instead there are many bicycles and horses. The ferries and the hotels have baggage handling well-organized. were at our hotel room door. As you can see below, the baggage is pulled by horse and wagon. The Grand Hotel about 15 years ago. It was the first trip for several of the ladies. back and shopped before making our on ways to the hotel. As I walked along the Main Street shops, I approached the Seabiscuit Cafe. I asked the lady standing outside the doorif they had anything gluten free on the menu. She said they had Gluten Free buns. Yipee! very little gluten free to eat for breakfasts and dinners. about the 1930's thoroughbred, Seabiscuit. The movie Seabiscuit shows continuously on TVs. Much of the movie was filmed at Keeneland Race Track in Lexington, KY. I felt like I was in my ole' Kentucky home! I considered ordering the Triple Crown Burger, but ordered the classic burger. on a gluten free bun in a restaurant. It was delicious! walked up the hill to The Grand Hotel. These signs are along the approach to the hotel. The broad front porch of the hotel is amazing. The view of the lake from the hotel is beautiful. Nancy, my roommate on this trip in the photo below. about a new Special Collector's Issue of Teatime Holidays. Gluten Free Magazine when I spotted the above beautiful magazine. for a Teatime Holidays special issue. driven by Jerry, husband of Phyllis, our Michigan tour planner and hostess. The above photo is taken from my seat. As result, Phyllis, Nancy and I are not in it. Our first destination was the Japanese Cultural Center in Saginaw, MI. built in partnership with the city of Saginaw and its Japanese Sister-City. taught at different schools and different ceremonies for matcha tea and sencha tea. involving the ceremonial preparation, serving and drinking of matcha. The ceremony demonstrated for us in Saginaw was the Ryurel style as explained below. Honestly I didn't "enjoy" my matcha. Honestly, I'm glad they gave us the option of not drinking the entire bowl of tea, unlike several traditional Japanese tea ceremonies I participated in during visits to Berea's sister-city in Japan at which I was obligated to drink the entire bowl as is required in the ceremony. 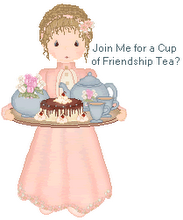 and the 2014 Tea Friends Gathering in Kentucky. then continued our drive north on I-75. All the photos on this blog are my own. However, there was quite a bit of photo sharing among the participants.